AIRmove² offers an optimum and economic protective packaging solution for customers with medium-sized packaging needs. The new AIRmove² air pillow system creates air pillows at the touch of a button, offering protection for your inside the box products. The machine’s compact dimensions mean the air pillows can be produced directly at the packing station. And with the production output of around ten metres of film per minute, the machine offers fast packing material availability. Thanks to its quick-start function, the AIRmove² is ready to use straight away. The air pillows created by the AIRmove² are ideal for wrapping, cushioning, and blocking and bracing products and for void fill in-the-box packaging applications. The Void film can be used for void filling in various cartons, to protect your products against shock and vibration. 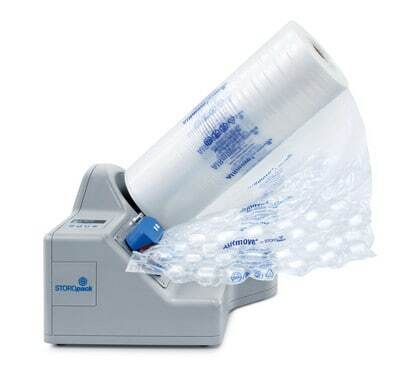 The Bubble film is ideal for wrapping fragile products. The Cushion film is primarily used for cushioning larger products. Airmove 2 is available for sale for small and medium needs. Al Thika Packaging is the exclusive distributor of Storopack in the Middle East. Since 1994 Al Thika has been supplying best packaging machine including Airplus & Paperplus in Dubai, Abu Dhabi, Sharjah, Fujairah, Ras Al Khaimah, Ajman, Umm Al Quwain, Al Ain – UAE, Saudi Arabia, Bahrain, Oman and many other Gulf countries.